It was a quiet evening on October 1, 1847. 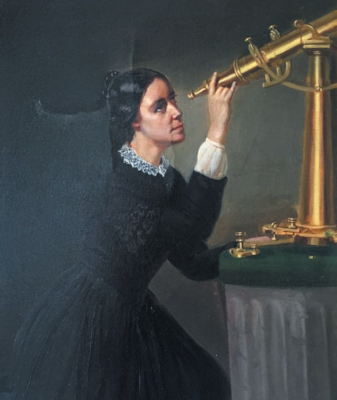 On the small island of Nantucket across the Atlantic, Maria Mitchell was looking into her telescope. She stared at the short blurry streak that wasn’t supposed to be there, and her hands shook with excitement. Was it what she thought it could be? Maria had studied the cosmos all her life. She once calculated the position of her own home by observing a solar eclipse when she was twelve. At 14, she had performed the navigational computations of the long journeys taken by whaling sailors. She ran down to the parlour to inform her father who had introduced her to the mysteries of the cosmos. Mr Mitchell, an equally ardent observer of the galaxies, rushed upstairs to look curiously through the telescopic lens and realised that his young daughter was making history. But Maria, contemplative and cautious, wanted to observe the object before making a firm conclusion. Mr Mitchell, swelling with pride for his daughter, quickly submitted a letter to the head of the observatory at Harvard to announce what he thought was a momentous discovery. The weather, indifferent to the fate of man, delayed the journey of the letter. By then, Francesco de Vico had reported the discovery of the same comet, and clinched the gold medal instead of Maria. However, this comet seemed new; uncharted by astronomers. The king of Denmark had offered a gold medal worth 20 ducats to the first lucky person to discover a telescopic comet. Even though the king had died, the king’s son was keen on fulfilling his father’s promise. Maria’s comet looked like a gold medal valued at 20 ducats! On the 7th of october, when the letter of Mitchell’s discovery reached the president of Harvard, Edward Everett, he decided to inform the American diplomat at the U.S. embassy in Copenhagen about the mistake. Eventually, the king of Denmark decided to award Maria Mitchell the gold medal, and she became the first woman to be elected to the American Academy of Arts and Sciences.